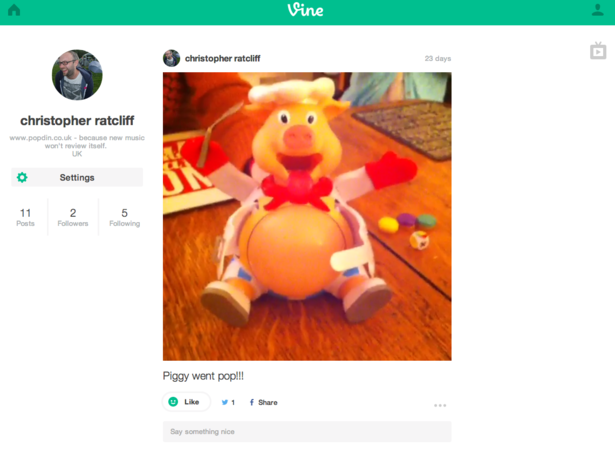 As of last weekend, Vine has finally introduced a desktop website. I say finally, Vine has only been going a year, but it’s still been an awfully long wait. The idea that a platform as supposedly trend-setting as Vine didn’t have a desktop presence is frankly ludicrous. I’ve been writing a regular round-up of the best Vines of the month on the Econsultancy blog for a few months now, and the lack of a searchable homepage has made this a much more long-winded exercise than necessary. Will my job be any easier from now on? Let’s see. I’m going to take a look at Vine’s new UX, along with a handful of other social media sites, and highlight some of the user experience issues I’ve been having with them all. First I’ll start with Instagram as this has been bugging me for a while now. Instagram is great for constantly being reminded by my closest friends of the beautiful places I’m not in as I stare at the scaffolding from the office window. What if I want to check out the images from a user marginally less depressing on a Monday morning? Let’s say Oreo for instance. Its excellent Instagram page is covered in the article how Oreo owns social media, unfortuneately I can’t access it from Instagram itself because there’s no search function. I have to leave Instagram, go to a search engine, type in Instagram Oreo, and click through to its own homepage. It’s an unnecessary and frustrating process. I can’t even click on the ‘following’ link within my own profile to find the profiles I’m following because these aren’t actual clickable buttons. Also, at the top of every page are these three tabs. Two of them do exactly the same thing. Both the ‘Instagram’ and the obvious ‘Home’ shaped button just go to the user’s Instagram feed. I am fully aware that Instagram is primarily set-up for mobile device use, being as it is essentially a socially enabled camera app. If you didn’t have a connectable camera device, you just wouldn’t be on Instagram. The mobile app itself has a great search function, filtering keywords either by profile name or hashtag. I would however suggest that a user is more likely to require this search function on a desktop, where they have more spare time to research profiles. I see the mobile Instagram app as mainly a time-filler, just a nice way to kill three minutes checking out the latest images from my friends. I rarely add followers or investigate other profiles. I would however do more of that from the desktop site if it worked better. As mentioned earlier, I finally have access to my own Vine profile on a desktop. These are halcyon days, people. I’ll thank you to ignore the piddling number of followers I have and understand that most Vine interactions happen on its owner Twitter’s site. Or at least that what I keep telling myself. This desktop site has only been available for a couple of days, so it seems premature to start pointing out the problems already. However Vine has gone for a hard launch, with full PR assault, so it seems confident in its product. Vine’s major mistake is using its rival Instagram as a template. So what does that mean? No search function. Two identical home buttons at the top of the page. Non-clickable buttons for ‘followers’ and ‘following’. The user has to leave Vine in order to find a particular user they wish to follow. It is still early days yet. Although Google has already indexed certain brand’s Vine pages. Here’s the SERP for Samsung Vine. It’s only the fourth result, although I’m sure that will soon improve. However this result is for Samsung’s latest invidual Vine, rather than its homepage. Once you’ve clicked through to the Vine itself, you have to click on the brand’s name before you can start following it. There’s no follow button on the individual Vine pages, which seems like another missed opportunity. How do you like the red line? You know, the little red line that connects conversations on your Twitter feed. Yeah, thought as much. This update in August 2013 created a great deal of hostility, with users decrying the counter-intuitive way that conversations are now read in the opposite direction to the standard feed. Personally I don’t actually mind it. Tweets now have immediate context, and it takes much less scrolling and back-tracking to find the thread of a chat you’re interested in. Much more annoying is the inability to edit a retweet. What if I want to add my own context, or add another user’s Twitter handle to draw their attention to the tweet? UX problems are made even more frustrating when you can achieve simple tasks like editing a retweet using a third party app, such as HootSuite or TweetDeck. Twitter now owns TweetDeck, so surely this small UX tweak can be brought into the Twitter interface proper? Pinterest does many things right on its desktop site. Its search function is probably the best of any social media sites. You can easily search for any keyword, within ‘boards’, ‘pins’ or ‘users’. You can even choose whether to search through ‘all pins’ or ‘just my pins’. I dream of the day when Vine or Instagram offers this level of thoroughness. I’ve written a lot of pro-Pinterest content on the blog (e.g. how retailers can drive sales using Pinterest and five examples of brands nailing Pinterest) so lets balance it out by finding something wrong with it. When you want to change the cover to one of your boards, you have to click through every image in your board till you get to the pin you want to use. This could take ages if you have hundreds of pins to choose from. Also, there could be a much better way to communicate to users you follow. You can easily comment under pins you like, but if you want to say something direct to the user that’s not particularly relevant to that pin, you’ll have to do so through another social channel if they have one, or have indeed linked to it from Pinterest. Facebook’s alright really, isn’t it… Isn’t it? As far as I’m concerned, as a Facebook user I get a lot of satisfaction from it. Thanks to Facebook’s EdgeRank, the people I interact with the most appear at the top of my news feed, and the people I barely tolerate, hardly even register. Facebook’s search function works exceptionally well too. In fact some experts believe that Facebook’s Graph Search could easily begin to rival Google in terms of power and relevance, such is the sheer volume of ‘big data’ at Facebook’s command. Even the introduction of advertising to Facebook news feeds, which many feared would ruin the experience, hasn’t really done much to stir the anger of users. In the Econsultancy blog towers, sponsored ads tend to raise more of a laugh than an indignant eyebrow. Matt Owen, our own head of social media, was treated to an advert asking him if he was suffering from deafness due to an industrial machinery accident. The only explanation for this bizarre targeting I could offer him was perhaps it’s because of his love of heavy metal music. So there we go. The Facebook experience is absolutely… Wait, hang on. I’ve just been handed this announcement from two weeks ago: Facebook to begin testing autoplay ads in news feeds. Some users have already begun to see this at work, with a trailer for the new film Divergent automatically playing in their news feeds during the last couple of weeks. There’s no clicking or tapping, the video just starts. At the end of the video, a carousel appears that showcases two more videos from the advertiser. Mercifully, this is without sound, unless the user clicks on the video itself, and you can still scroll down to avoid the video all together. Still, this is a chilling vision of possible things to come. Here’s our own Chris Lake’s very correct opinion on why we hate pre-roll video ads. And don’t even get David Moth started on Facebook hashtags. For more spleen venting, here’s an article about the user experience problems with iOS7. 90% of data in the world today was created in the past two years. Using social media, brands have an unparalleled opportunity to hear what their customers and potential customers think and feel about them. Brands have always monitored what is written about them, but social listening is something different. Listening is active. It usually requires you to do something as a result of what you’ve heard: spotting issues early, righting wrongs, surprising and delighting customers, marketing in real time, and gathering insight and intelligence to help you develop better products. It’s easy just to focus on the influencers, and ignore the small voice in the crowd. But this can be a mistake. US insurance company Harvard Pilgrim didn’t respond to a customer complaint, first offline, then online, when the customer published a blog post about the problem. Although the readership of the blog was barely in double digits, when the post was tweeted it went viral and 1,000 people read the post.